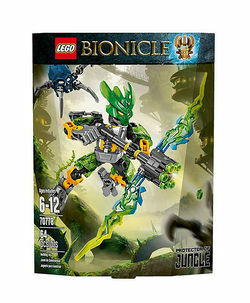 70778 Protector of Jungle is a BIONICLE set released in 2015. Vizuna is a warrior who defends the Region of Jungle. He later joins the other Protectors in summoning the six Toa and helps Lewa to procure his Golden Mask. This is a description taken from LEGO.com. Please do not modify it. (visit this item's product page) Block Skull Spider attacks with the Protector of Jungle! Beware! The evil Skull Spider is mounting an attack deep in the jungle. Swoop to the defense of the Protectors’ village with the awesome Protector of Jungle, a sturdy, buildable figure featuring a dual-tone mask with pop-off trigger. Adjust the arms and legs to create fearsome battle poses. Then unleash the huge Air Elemental Flame Bow’s rapid shooter and send the Skull Spider scurrying for safety. Don't let the Skull Spider pop off the mask! Combine with 70784 LEGO® BIONICLE® Lewa – Master of Jungle using building instructions available at LEGO.com/BIONICLE to power up for ultra elemental battle! Facts about "70778 Protector of Jungle"
Block Skull Spider attacks with the Protector of Jungle! This page was last edited on 9 January 2016, at 20:20.